ACID est à l'origine un logiciel destiné à l'utilisation de boucles audio, doté de fonctions originales pick, paint, play idéales pour la création de musiques basées sur des boucles. ACID intègre aujourd'hui des fonctions avancées d'enregistrement multipiste et de séquenceur MIDI. Fixed a bug that prevented ACID Pro from being used as a ReWire device. * The Mastering Effects Bundle 2 plug-ins (available with Sound Forge Pro 10) are now available in ACID Pro. * Added support for the PreSonus FaderPort. * Several fixes and enhancements have been implemented to the Mackie Control Universal. Additionally, Fast-Forward and Rewind on the MCU transport have been enabled. * Fixed a bug that caused the right-front and right-rear channels to render silence when rendering a 5.1 surround project using six mono files. * Fixed an issue reading QuickTime audio when using QuickTime 7.6.4. * Fixed a crash when displaying the Audio tab for QuickTime templates when using QuickTime 7.6.4. * Several fixes have been implemented in the Plug-In Manager. * A Force Rebuild check box has been added to the Plug-In Manager to allow you to rescan your audio plug-ins. * Fixed a bug that could cause nested folder tracks to display incorrectly when collapsed. * Fixed an issue that caused the Options > External Control setting to be reset when restarting ACID Pro. * Fixed an issue that could cause some VST plug-ins (including Reactor 5 FX) to draw their interfaces incorrectly. * Fixed a crash that could occur when using Beatmapped media with Key or Time Signature change markers. * Fixed a problem that prevented MIDI track mute envelopes from loading correcly. * Fixed a problem that caused auxiliary or input bus sends to load their settings incorrectly when multiple busses were used in the project. * A problem that prevented MIDI Bank Select in the DLS Soft Synth from working correctly in Windows Vista has been resolved by Windows Vista SP2. * Fixed a bug that could cause sub busses to be routed to hardware outputs when loading a project in certain cases. * Fixed a bug that could cause ACID Pro 7.0b to crash if audio was dragged to an empty timeline while playback was in progress. * Fixed a bug that could cause a crash when moving a MIDI note on the timeline during playback when using some VSTis. * Fixed a bug that could cause continuous data to MIDI controllers normally in "switch" mode (e.g. sustain pedal) to be misinterpreted as full-scale "switch" transitions. * Fixed a bug that could cause a crash when using multiple instances of the Garritan ARIA player v1.0.5.1 with multithreaded soft synth playback enabled. The solution requires an update to Garritan ARIA v1.0.6.5 or later also (see Known Issues below). * Fixed a bug that could cause ACID Pro 7.0b to crash during MIDI track freeze when using soft synths whose outputs were routed to hardware outputs via sub busses. * The sample project files on the installation DVD now play correct sounds when running under Windows Vista SP1 or later. o Recorded waveforms are now updated at a faster rate. o 16-bit peak files are used for increased resolution. o The entire waveform is now visible during recording. o Peaks no longer need to be built when recording is completed. * Plug-In Manager performance has been improved. * Performance has been improved when working with projects that contain many MIDI loops. * An Enable multithreaded soft synth playback check box has been added to the Audio Device page in the Preferences dialog. Select this check box if you want ACID to use multiple processing threads for playing soft synths. On multicore/multiprocessor computers, this setting can significantly increase performance during playback and real-time rendering. Clear the check box if you're using a single-core processor or if you're using soft synths that do not support multithreaded rendering. * ACID can now render to Advanced Audio Coding (AAC) format. In the Render As dialog, choose Fraunhofer AAC from the Save as type drop-down list. 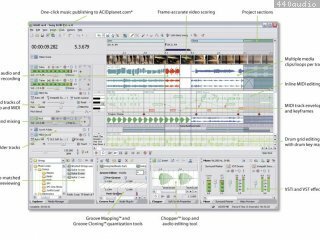 If your project contains a video track, you can render the audio portion of your project as AAC using the Main Concept codec. In the Render As dialog, choose MainConcept AVC/AAC from the Save as type drop-down list. The Main Concept codec is not available unless your project contains a video track. * Keyboard shortcuts have been added for common Mixing Console functions. * You can now set Mixing Console channel strip widths by choosing a command from the channel strip shortcut menu. * Fixed a bug that could cause ACID to hang when adding or routing busses in 5.1 surround projects. * Fixed a bug that prevented MIDI clips from being exported from the Clip Properties window. * Fixed a bug that could cause audio to drop out when using the ExpressFX Dynamics plug-in. * Fixed a bug that discarded marker, section, and region information when rendering to WMA or WMV formats. * Fixed a bug that caused stretch markers to be duplicated when reloading a loop. * Fixed a bug that prevented mute envelopes from being displayed properly on MIDI tracks. * The cursor no longer lands between markers when jumping through areas with tempo curves. * Pitch shifting a single audio event no longer pitch shifts the entire track. * Fixed a bug that caused audio to be rendered improperly when the Sound Forge Wave Hammer plug-in was assigned to the ACID master bus. * The élastique plug-in has been updated for improved performance. * When the Close audio and MIDI ports when ACID is not the active application check box in Preferences > General is selected, external control is also suspended when ACID is not active. * When you edit a clip in an external editor, audio, MIDI, and external control hardware is released regardless of the Close audio and MIDI ports when ACID is not the active application check box setting. The ports are re-enabled when focus is restored to ACID. * The Save each track as a separate file check box is now available when rendering projects that contain video. When this check box is selected, each rendered track will contain the video strream as long as the rendering template is configured to render video. Fixed a bug that could cause ACID to crash when switching between audio devices. * Fixed a problem that could prevent metronome countoff from working correctly. * Fixed a bug that could produce an incorrect recording when changing your project bit depth or sample rate while a track is armed. * Fixed several bugs that could occur when using ACID as a ReWire device. * Fixed a bug that could cause a crash when routing an input bus's input and output to hardware ports. * Fixed a bug that caused an error when rendering to WAV format with rendering templates that use the GSM 6.10 format. * When saving projects with soft synth automation, envelope fade types are now preserved. * Fixed a bug that caused all uncategorized plug-ins to be moved when moving a single VSTi plug-in from the No Category folder to a user folder. * Fixed a bug that caused plug-ins to sort slowly in the Plug-In Manager window. * Fixed a bug that prevented peak meters in the Mixing Console window from resetting when stopping playback. * Fixed a bug that prevented control surface channel-tracking indicators from being displayed in the Mixing Console window. * Fixed a bug that could prevent the Mixing Console from saving its size and layout after restarting ACID. * Fixed a bug that could cause Beatmapped events to be offset when dragging events on the timeline. * Fixed a bug that could cause ACID to hang when changing a track's color. * Fixed a bug that prevented single-tempo Beatmapped clips from updating their tempo correctly when using the Initial tempo (BPM) control on the Stretch tab of the Clip Properties dialog. * External control surface channel tracking. * Custom labels for ASIO drivers and ports. * Support for opening and rendering FLAC files. * Support for opening and rendering AAC files. * Support for rendering AC-3 files with the Dolby Digital AC-3 Studio plug-in. * Mixing Console window for a traditional hardware-style mixer view. o You can now route busses to assignable effects via the Mixing Console window . o You can now route busses to multiple sends via the Mixing Console window. o If you want to apply track panning to bus or assignable FX sends, right click the bus or FX fader in the track header and choose Link to Main Track Pan from the shortcut menu. * The Track Prefader Sends Listen to Mute check box in Preferences > Audio enables pre-volume sends from tracks to busses and assignable effects to respond to the track mute state. * Input busses allow you to record from external devices with effects, mix external audio sources with your project, use external effects processors with your tracks and busses, and provide input monitoring. * Audio, MIDI, and bus tracks now include output meters. * Tempo curves between tempo markers. 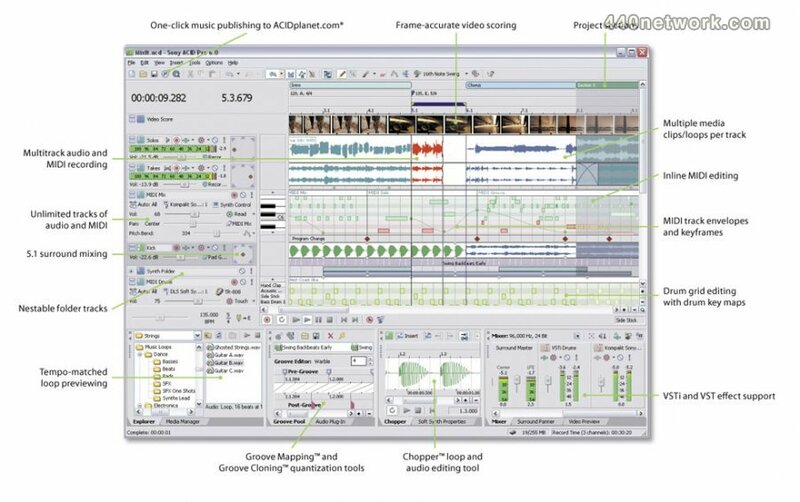 * Enhanced timestretch and pitch shifting for Beatmapped clips with élastique Pro. * Enhanced Beatmap markers for clips with multiple tempos. * Phase, normalization, and channel control for audio clips. * You can now invert the phase of audio tracks. * Mute and lock event switches. * You can now drag events across tracks to create and move clips. * Improved plug-in scanning via the Plug-In Manager. MIDI ports that are used by the Generic Control device driver are no longer reserved exclusively for external control and automation. If you have a MIDI controller that includes buttons and knobs, you can use the device as an external control device and as a MIDI input device—for example, you can use the buttons, knobs, and sliders on the device for external control, and still use the keyboard, pitch wheel, and modulation wheel for recording MIDI. MIDI messages that are mapped to external control functions are filtered when you record MIDI. Multiple velocity stems can now be selected and edited with the Selection tool when in inline MIDI editing mode. SMF type 0 files now report their track count correctly. A bug has been fixed that could multichannel MIDI files from ACID 4 or ACID 5 projects to load incorrectly. A bug that prevented rendering to QuickTime format has been fixed. An alternative drawing method has been added for VST instruments. Right-click an instrument on the VST Instruments tab in the Preferences dialog and choose Use alternative drawing method. This alternative method may resolve issues with some VSTis displaying their user interface incorrectly. A bug has been fixed that could cause ACID to crash when pasting an envelope to a MIDI track. A bug that caused ACID 5 projects to load with incorrect MIDI envelope data has been fixed. A bug that prevented aftertouch data from being exported with MIDI has been fixed. A bug has been fixed that could cause ACID to play out of synch with external MIDI devices. The Pitch shift and Speed settings can now be adjusted independently in the Event Properties dialog for one-shot clips. A bug has been fixed that could cause a crash when loading a stereo project when a 5.1 surround project was open. A bug has been fixed that could freeze the Mackie Control Universal when enabling 5.1 surround mode. Various improvements have been made for using ACID as a ReWire synth. A bug has been fixed that could cause audible clicking when playing fade-ins and -outs on looped audio events. Pan envelopes are no longer hidden for busses that are routed to hardware outputs.